Resident Evil: Degeneration, virus or vaccine? We don’t like to remind people of awful movies based on videogames around here. We still have nightmares about Final Fantasy: The Spirits Within, Street Fighter: The Movie and Max Payne. We also have a fond love of zombies and were hoping the CG film Resident Evil: Degeneration would give us that extra spark that would tide us over until Resident Evil 5 is released in 2009. After viewing the film we’ve decided to put our two cents in on whether Resident Evil: Degeneration is a success or a bomb similar to the one which destroyed Raccoon City. Resident Evil: Degeneration takes place seven years after the events of Resident Evil 2. 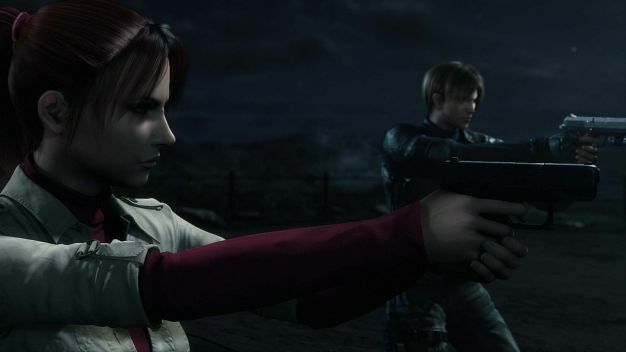 It follows Claire Redfield as she enters an airport as a member of a group dedicated to help citizens who become the victims of virus attacks similar to the outbreak in Raccoon City. It’s at this point where we can take what we assumed about watching trailers and throw it out the window. We expected this movie to take place in the airport as Claire, Leon and others fight their way through hordes of zombies. They do fight in the airport, but it only lasts for about one fourth of the movie. This doesn’t really hinder the plot of the movie, but the main setting for the rest of the film may confuse even hardened Resident Evil fans.The headquarters of WilPharma is the building that our protagonists will find themselves in most of the time and further confuses the Resident Evil lore. The plot also feels a little rushed at times. It seemed that there was a lone zombie in the airport and literally seconds later, an infestation breaks out. Once Leon Kennedy comes on the scene, complete with his bad boy jacket and emotionless demeanor, the action begins. He immediately becomes the leader and comes up with a plan to escape the airport. The problem is that the moment he reveals his plan, the scene warps to the point where they’re almost home free without a beginning or middle part to their escape. There’s even some additional characters that aren’t explained during the escape and we have no idea where they came from. The story in Resident Evil: Degeneration is based in terrorism surprisingly enough. There’s a guy that wants the truth about Raccoon City to be revealed or more cities will suffer the same fate. It doesn’t explain the origins of the T-virus as it’s assumed we already know enough about the series to make a decent rationalization. Without spoiling the ending, we can say that an element of Resident Evil 5 does show up at the end. If you want to see a deep movie that holds your hand through and through then Resident Evil: Degeneration isn’t for you. It’s filled with head shots and characters that aren’t too memorable. It accomplishes setting up a lot of events that could be cut scenes straight from the game and tons of action sequences. It won’t win any awards, but die hard fans would probably give it one and a half thumbs up.